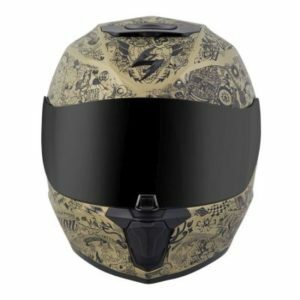 Home All Helmet Reviews Great value full face – but not in Europe just yet. 1 Looking to buy one? 8 Best place to buy one? 14 Looking to buy one? The Scorpion EXO 410 Air we reviewed a few years ago has now been replaced by… the imaginatively named Scorpion Exo-R420! Well, it's not available in Europe yet so you'll have to either jump on over to our US site where you'll find a few great stores you can buy one from. 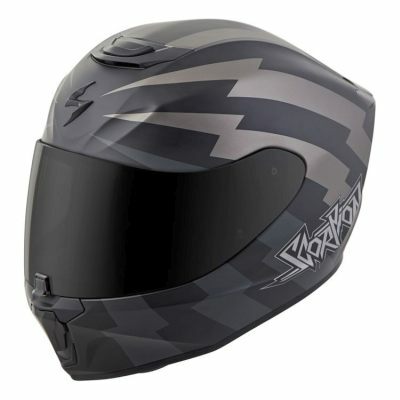 Or if you want one NOW, you can hop straight over to Revzilla (USA) who'll ship one over to Europe, no problem. But remember, it'll only be a DOT certified helmet without an ECE certification sticker on the back so isn't legal to use anywhere in the UK or Europe. Please see here for more info on our recommended retailers. OK, the Scorpion EXO R420 is only DOT certified which means it’s been made to meet DOT safety standards. So far it hasn’t been ECE certified so isn’t legal for use in Europe. It’s also been tested by those nice folks at the Snell Memorial Foundation in California who’ve subjected a bunch of R420s to all kinds of anvil and drop-testing related shenanegans and passed it with a Snell M2015 stamp. 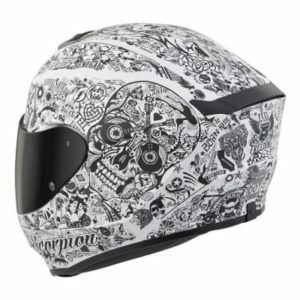 Short of launching yourself off your bike on the motorway, Snell certification is one of the world’s best testing standards for motorcycle helmets and means the Scorp R420 should give you a great level of impact protection. 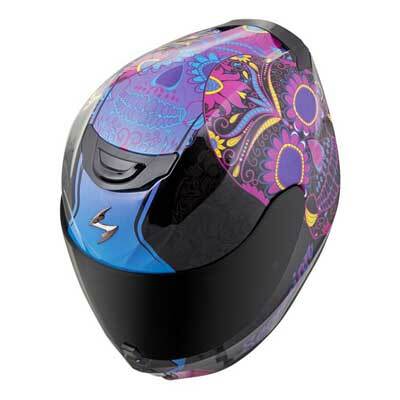 So, yeah the R420 is a polycarbonate helmet, and yeah that means it’s a helmet at the cheaper end of the shelf. But yeah, it’s still going to give you great levels of protection for not much money. Of course, the visor is a key feature for safety. 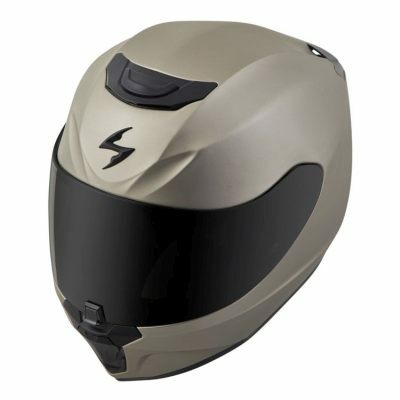 And Scorpion has added a visor with an anti-fog coating and visor lock to stop it popping open. It’s also got got decent peripheral vision too. Read more detail in the visor section below as usual, but that’s a stack of features which should help from a safety perspective. All in all though, with that Snell sticker on the back and DOT approval, the Scorpion EXO R420 has gotta represent some of the best tested level of safety for not much money that we’ve seen in a while. But note, DOT isn’t accepted across Europe so because the R420 isn’t ECE approved, it’s not legal to use there. 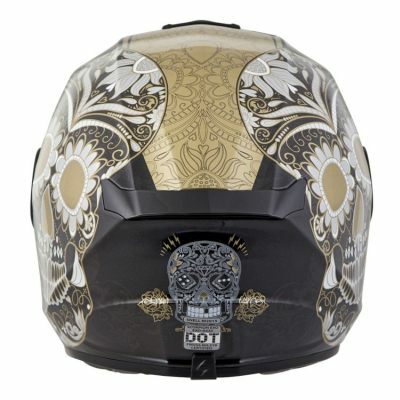 So if we say folks reckon a helmet’s whisper quiet, that doesn’t necessarily mean you will too when you hit 90? But that chin vent is actually a 3 way vent with a slider that moves from closed to visor vent to face vent. And the word from owners is that it works great. Enough said. Obviously, apart from keeping you cool, we need air to blast onto the back of the visor to keep things clear there, and that chin vent combined with the anti-fog coating that comes as standard seems to do the job in most circumstances. But more on that below. 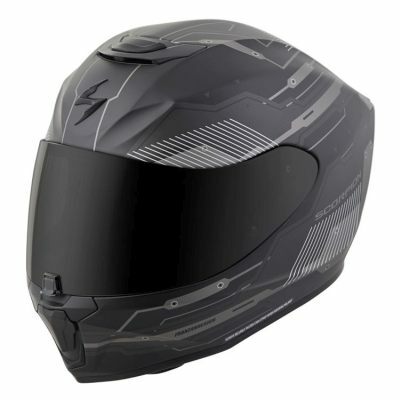 The Scorpion EXO-R420 comes with a clear visor if you buy one (not the dark visor in all the photos you’ll find everywhere!) 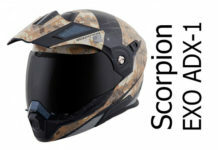 and has what Scorpion call an Ever Clear visor with an Ellip-Tec II ratchet system. Rrrright. The Scorpion R420 Tracker in black & grey is a class act. Remember though, you’ll get a clear visor only in the box if you buy one. Ever Clear is their anti-fog coating on the rear of the visor which is a pretty good anti-fog system. Owners mostly say it works really well, except for when things get really cold when you’ll probably have to crack the visor to let some air in. And if the Ever Clear doesn’t work for you, well there’s always the option of buying a Pinlock, though you’ll have to buy a Pinlock ready visor too which is going to bump the price up quite a few quid. 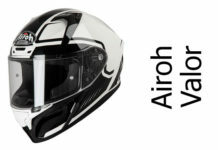 Ellip Tech is the name of the face visor hinge system which is designed to pull the visor back towards the seal to keep things nice and wind/weather proof. It’s pretty good, though a coupla folks said theirs gets a bit drafty at times – though no one complained about water getting in so that’s good. The visor works on a ratchet, has a nice defog/cracked open position if that’s your thing, and it has a central opening tab and lock combo. A few owners said the visor lock’s really fiddly to work and can be tricky to find too when you’ve thick gloves on. But others reckoned it just takes a bit of practice and you can unlock it while pushing up the visor in one deft move with no problem. I can’t find anywhere on Scorpions’ official pages saying it’s an optically correct visor, though a few reviewers say it is. Either way a) I’ve never had a problem with any helmet distorting my vision to the point it’s distracting – or even particularly noticeable and b) they reckon the visor’s pretty damn optically correct anyway. So all good there. And finally, while there’s a decent amount of horizontal vision from that visor opening, it’s a little more restricted vertically. 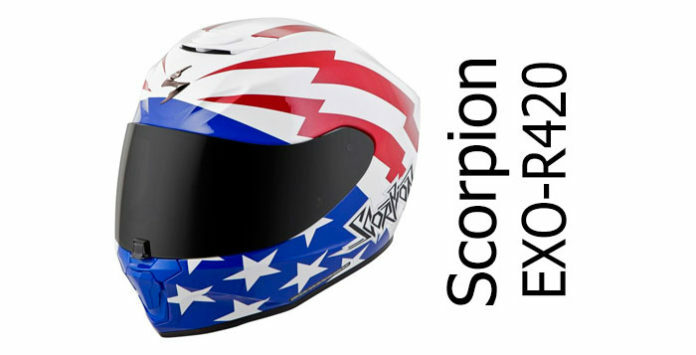 So while it looks like a sportsbike helmet, if you’re planning to spend most of your days with your chin on the tank, you might want to look at our sportsbike helmets section instead because the Scorpion isn’t a true track helmet. 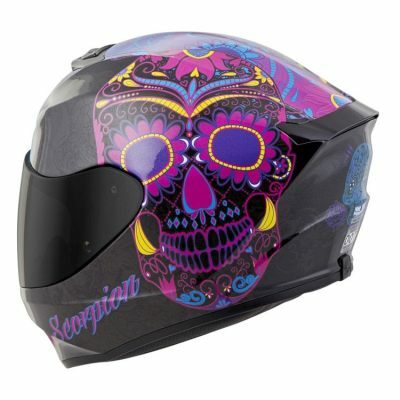 But they’re also starting to take a leaf out of Icon’s catalog because they now offer a some edgy graphic versions too. That includes the Shake range that looks like someone’s gone crazy with a sharpie, the Sugar Skulls (name says it all!) and the high voltage Trackers. Best place to buy one? Remember, this helmet isn't DOT approved for use anywhere in Europe. You can buy one from the US, but it'll be a DOT certified helmet without an ECE certification sticker on the back so isn't legal to use anywhere in the UK or Europe. OK, if you still want one, you can jump over to our US site where you'll find a few recommended stores. Or if you're looking for a quality US retailer right now, we recommend Revzilla (USA). They're based in Philadelphia and offer outstanding service (at the time of writing 9.8/10 on Reseller Ratings) along with free delivery (within USA only but reasonable shipping rates outside - see our recommended retailer link below for more info). Please click the link below to drop onto their Scorpion helmets page. And if you buy from any shop, we get a small sum from the sale at no extra cost to you - a massive THANKS! (it's how we finance the site). Click here for more info on our recommended retailers. But don’t forget, it’s also a Snell certified helmet, meaning it’s been shown that it’ll offer great protection – which not all helmets can say. Plus it’s got a great visor system with antifog, EQRS (which not many helmets at this price point have) and is hyper comfortable and reasonably quiet. Oh, and don’t forget it looks cool too – very important that. All for way under £200. All in all, if that’s your budget, you don’t mind buying from a US vendor and you’re looking for a great all rounder, then the Scorpion Exo R420 is a really attractive package that you should really check out. First up, there’s the Italian AGV K3 SV – that was tested by SHARP where it scored 4 stars out of 5 for safety. It’s got a built in sun visor too and comes with a Pinlock anti-fog insert. The HJC FG-17 is another SHARP 4 star rated (and Snell certified) full face that’s comfortable and a great all rounder (but with a more sportsbike focus) – at a sub £200 price point too. 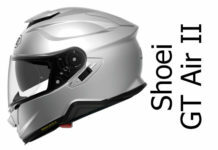 For a bit more money, you could be riding in a Shoei RYD, that’s a great all rounder helmet that’s a SHARP 5 star (maximum) rated full face that’s US Snell approved as well. It’s got EQRS, Pinlock and great ventilation all in a premium package. The Scorpion EXO R-420 is a great value package. It's DOT and Snell M2015 certified meaning it'll give great protection (though it's not ECE certified for Europe). 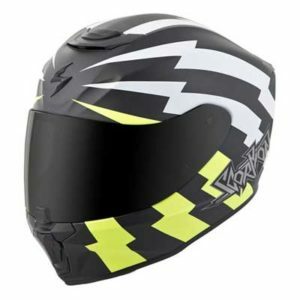 It has a quality quick release visor system with anti-fog, it's highly rated for comfort and build quality too - all at a hyper competitive price point. 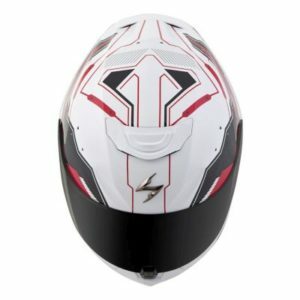 Well worth a look if you're after a low price all rounder motorcycle helmet.